Luke Valente in action for Peel at Optus Stadium. 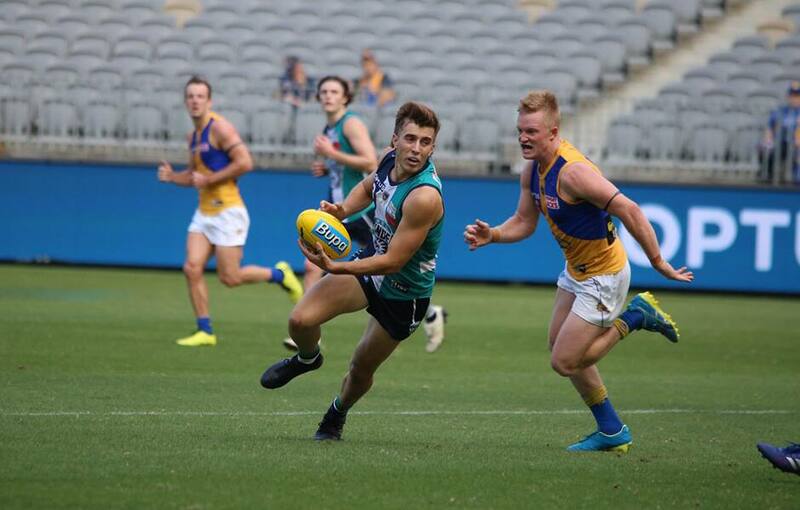 Peel Thunder fell to the new West Coast Eagles WAFL team at Optus Stadium on Saturday. The game was played as a curtain raiser for the Fremantle v West Coast clash later that night. Peel fought hard in the first half before the Eagles ran away victorious 11.11 (71) to 6.14 (50). Despite the Thunder being within 15 points at half time, West Coast’s increased pressure in the second half drove home the win. Young Fremantle midfielder Tom North said a number of positives came out of the game despite the loss. “It was a bit disappointing but I think we did pretty well in the stoppages,” he said. “I think they just cut us up a bit off half back, and we didn’t spread very well, so at the end of the day they just outran us”. North collected 28 disposals and seven tackles playing as ruck rover. Mitch Crowden was best afield for Peel collecting 26 disposals and eight tackles, with North saying the young midfielder was making a case for a Fremantle call-up. “He’s been great, he’s had a good pre-season, he’s unlucky not to be in the Freo side just because he’s been putting up the numbers,” he said. “I think it if he just keeps knocking down the door he’ll be moving his way up”. Other high-achieving players included Sean Darcy in the ruck, collecting 44 hit-outs and eight tackles. “It’s always a bit weird, I’m a good mate with Brady and its good to see him doing well and captain of the side. He hits hard so you have to watch out for him on the blind side, but it was good”. Looking ahead to round three, North said he was confident for Peel’s upcoming clash with East Fremantle. “[We have a] six day break so we’ll have to recover pretty well and just do all the right things, go out there and get a win,” he said. Peel will face East Fremantle at 4.30pm next Friday 19 April at Rushton Park.